Home » Using a Wetsuit » What Do You Wear Under a Wetsuit? Our thorough article on triathlon clothing describes the ins and outs of what to wear from swim to run in a tri, so we won’t rewrite what we provided there. There are a few quick ways to answer this question, however, and we will attempt to do that here. What Goes Under a Wetsuit? In short, the best thing to wear under your wetsuit during a training swim or a race is exactly what you would wear for your bike and run legs of the event. Note that for men, this may or may not include your top — if you plan to simply wear a workout shirt for the latter two events, there is no way you want to get that wet during the swim. But for racers dressing up in your traditional tri gear, the wetsuit goes on right over it. A good pair of tri shorts are key to the race, and as long if you have truly purchased shorts made specifically for triathlon, they should be low-profile and hardly be noticeable under your wetsuit. Tri shorts are fine to get wet in the water, and will dry quickly once you get out. They are also padded just enough to provide comfort on the bike, but not so much that they interfere with the run. Tri shorts are a key piece of equipment to have on for the whole race. 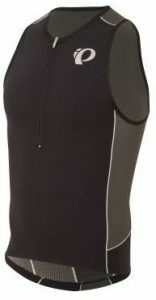 As for the top, men and women might both consider wearing a singlet — a tri-specific top — which can also be worn under the wetsuit. This is designed to get soaking wet in the water, but then stay on for the bike and run legs. A good Tri top will not bunch up under the wetsuit, and will keep its form-fitting shape. Ditto for women sporting a sport top. Otherwise, you go shirtless for the swim and throw a running or workout shirt on at the first transition. 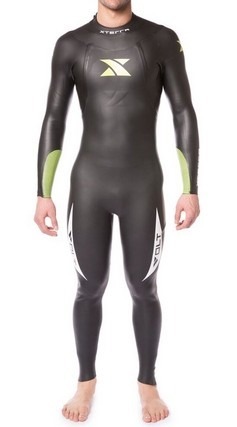 Those who go all-out and choose to wear an actual triathlon suit can easily wear that under the wetsuit. Triathlon suits are specifically designed to be worn for every leg of the race. The key is to remember that everything under your wetsuit will get very very wet — this might go without saying, but the wetsuit will not actually keep any of your clothing from making contact with water. Therefore, everything under the wetsuit needs to be made with quick dry technology, and any tri-specific singlets, shorts, or suits normally are. As with everything tri-related, remember the mantra of “nothing new on race day.” Always test your wetsuit in a practice session, searing the exact clothing that you plan to use in the race, making sure it is both comfortable under the wetsuit as well as able to dry quickly once out of the water.